Mon, Apr 8, 2019, 08:05 pm SL Time, ColomboPage News Desk, Sri Lanka. 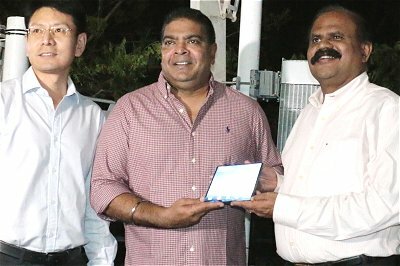 Apr 08, Colombo: Mobitel (Pvt) Ltd, the National Mobile Service Provider in Sri Lanka successfully showcased South Asia's first 5G deployment over a Mobile Network on Friday 5th April 2019, the company said in a press release. Mobitel's successful implementation of 5G was hot on the heels of the 5G deployments in the U.S.A (2nd April 2019) and South Korea (4th April 2019), connecting a commercial Mobile smartphone to its 5G network. Mobitel correctly identified Enhanced Mobile Broadband, Massive Internet-of-Things and Mission Critical Services as the primary pillars of the 5G revolution way back in 2016. Thus, Mobitel has been strategic and focused in its 5G journey and first demonstrated its 5G leadership in 2017 with the demonstration of Massive IoT in 2017, this was followed by Mission Critical Services in 2018. With Friday's pilot deployment of Enhanced Mobile Broadband (Mobility), Mobitel's 5G revolution in South Asia is unparalleled and its strategic approach is now being proven to be correct and is on course for benefiting Sri Lanka. SLT Group Chairman, P. G. Kumarasinghe Sirisena speaking at the launch of Mobitel's all-encompassing 5G showcase said his greatest joy and pride has been that Sri Lanka through Mobitel has positioned itself as Global leader technology. The 5G revolution at Mobitel was certainly a heady mix of technology and human expertise. Mobitel, Senior General Manager - Engineering & Operations, Rasantha Hettithanthrige was euphoric when he said ''We've had technology advancements in the past, but this one was particularly special. Bringing Mobility to 5G is truly ground breaking at this moment of time. Getting high-speeds is easy, but giving it wirelessly and with Mobility is truly phenomenal! While I am excited at the technology, I am particularly proud of how we stuck to our plan in ensuring the 3 pillars of Massive IoT, Mission Critical Services and now finally Enhanced Mobile Broadband have come together to give people a realistic taste of what 5G offers." Mobitel has a rich history of not providing technology for technology's sake but providing technology at the right time for empowering Sri Lankans and leading Sri Lanka on its Digital journey. Mobitel's 5G revolution is another step in this exciting journey.